Almost too cute to eat! 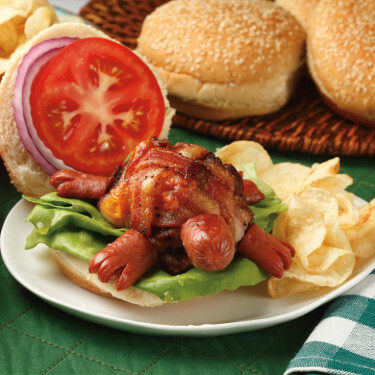 This bacon turtle burger is sure to please even the pickiest of eaters at your dinner table. Preheat oven to 400°F. Start by weaving the bacon like a basket. Cut some of the fat off the outside of the bacon to make the edges straight. Mix the ground meat, spices and egg white. Form a meat patty and place it on the woven bacon. Place some garlic cheddar on the patty. Top with another patty. Place some more garlic cheese to the top layer. Fold the bacon weave over the entire patty. Make 3 cuts into the "feet" hot dogs and one cross-wise into the "head" hot dog. Carve out a conical tail as well. Make holes into the bacon weave. Poke hot dogs into the body, embedding them into the meat by about 1". Use extra bacon to cover the gap and bring stay ends of bacon into the weave. Use spatula to transfer the patty onto a medium, oven-proof pan. 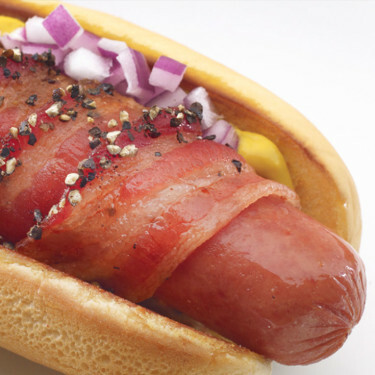 Put toothpicks (that have been soaking in water) into the body to secure the hot dogs and keep the bacon secure. Cook for about 45 minutes. Use an oven thermometer to determine the wellness of the burger.